Games: Let’s face it, Super Bowl commercials are almost as big a part of the show as the actual football game. 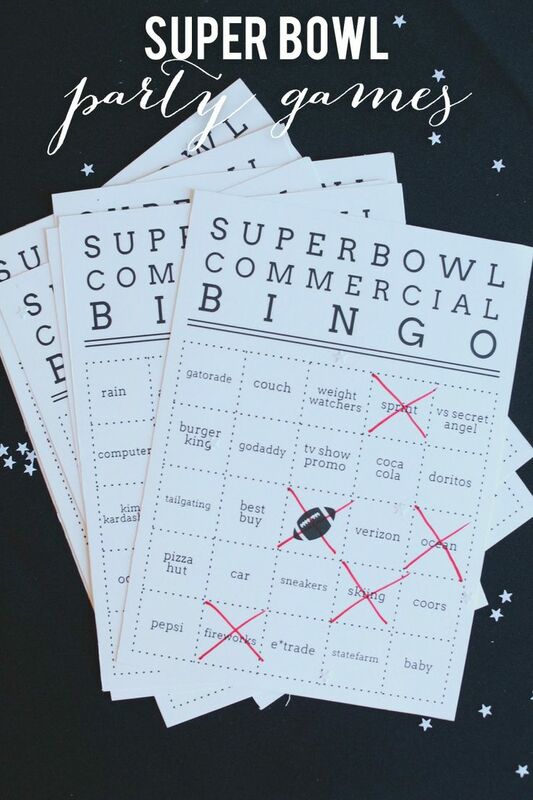 Embrace it by playing ‘Commercial Bingo’. Click here for a downloadable file of the game below. Another activity that my entire family enjoys is “Prop Betting”. Prop bets are fun little wagers to get people involved in the game when they could really care less about the two teams playing. Have everyone kick in a dollar when they arrive and the person with the most correct predictions wins the pot. An alternative to this is to buy a prize ahead of time vs. collecting money. 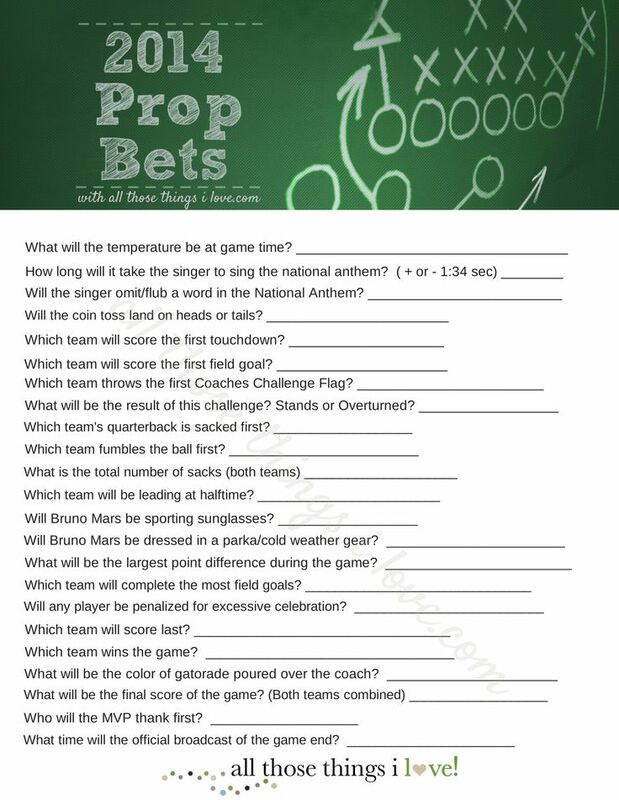 Print the sheet below here and you’re all set! 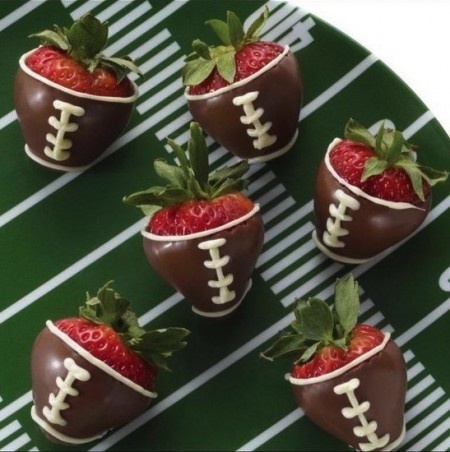 Food: I’m convinced that the Super Bowl party is one of the main reasons so many diet related New Year’s resolutions fail. But how can you not partake in the delicious junk food that makes it a Super Bowl party? It would be un-American! 1. 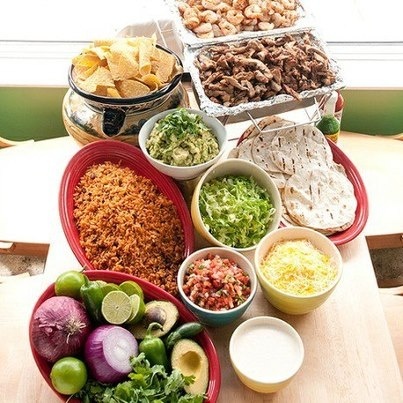 Taco Bar – most of it is make ahead and almost everyone loves tacos. 2. 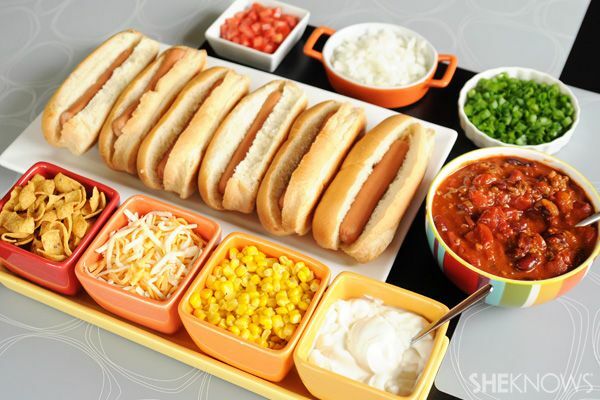 Chili and hot dog bar – another good make ahead option and a favorite with adults and kids alike. Decor: While it’s definitely optional, I think scattering a few football props on your serving table or a side table can add to the festive feel. I love the idea (below) of using inexpensive green felt from the craft store to cover your table. Add white duct tape for your yard lines. Party City carries scads of stuff that can amp up your football theme. I also found this referee shirt bottle koozie that would help recreate the look below. Where there’s a party post, there’s almost always a Pinterest board. 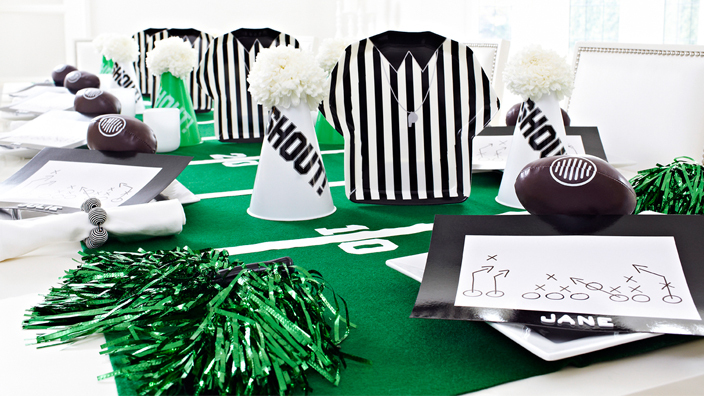 Click here for my favorite Super Bowl party pins.